Plying can be fun! * | carpe diem! and very, very educational. If you like this kind of thing. I recently revealed the Ugly Yarn, a mottled skein of orange and blue and white created by plying a singles of random lengths of blue, orange and white with a singles of blue. I decided to try Navajo plying to see if that made a more attractive pattern. My first and second efforts. My word, but that takes coordination! 30 minutes once a day will be ample exercise for my brain. I thought the patterning, the neatly defined blocks of colour, much more attractive. In the skein. It’s the knitting that counts. On the left, the Ugly Skein. 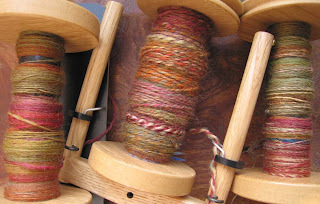 On the right, the Navajo-plied skein. I, er, I quite like the Ugly Skein heathering. 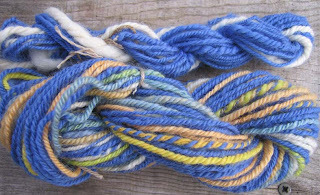 The bright, clear striping of the NP yarn does nothing at all for me in those colours, although I can see that being able to force striping could be useful. The coolest thing is the difference in the texture of the fabric, and the skeins, for that matter. The standard 2-ply is a nice, soft knitted fabric. The NP on the other hand has bounce! The added twist makes it seriously sproinggy. (I completely messed up my third attempt at NP’g by neglecting to think through how the brake would affect bobbin speed, resulting in a yarn of such lively sproingginess it almost leapt back out of the rubbish bin before the lid closed.) Apparently if the singles is well-spun and even, the little knot-equivalents where the loop begins aren’t noticeable in the final yarn. I may try this on the sole of my foot, as (spun and plied correctly) I think this yarn would be both soft and hard-wearing. This was so much more interesting and exciting than the work I should be doing that I decided to reward myself with something more attractive than blue, orange and white. I pre-drafted a length of the very felted hand-dyed finger-wide roving I bought last September at Alexandra Palace, and dug out the dyed silk top that I’d thought would look good with it. 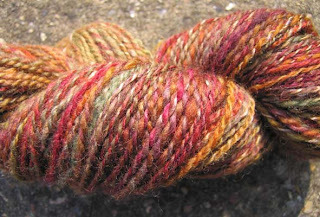 That’s a bobbin of the singles spun from the merino (note the intensity of the colours) with the silk top at bottom right. When I’d spun half the weight of the roving I started another bobbin using the rest of the roving, randomly mixing in lengths of silk top. The result can be seen to the right in the photo below. 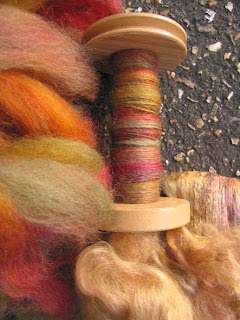 The pale silk has diluted the intensity of the colours (contrast with bobbin on left or above). Verrrrrry interestink. And in the middle is what I got by plying these two together. I knew the added silk was making the second singles thicker than the first, but I was nonetheless surprised by the bulk of the end result. I thought I was spinning more finely than this, but perhaps the merino was reverting a bit to the crinkled mess it was in the roving. I don’t really care. It may be thicker than I’d expected, but it’s very pretty. I’ve got about 10 or 20m of the pure wool singles left, so I’m plying that with pure silk. It’s very pretty too. * even more fun than duct tape, and it doesn’t smell of plastic. This entry was posted in Uncategorized on April 2, 2007 by sarahw. Lovely yarn, and interesting knitting “research!” Merino has an enormous amount of booongy energy to it. Spin it as thin as you can and you’ll be amazed to see how fat it gets when plied and you’ve set the twist. It is a remarkable phenomenon.I think it takes a long time and a lot of imagination to be able to look at a skein of yarn and know what the swatch will look like. Some color combos will always surprise me, too…no matter what I think I “know” beforehand! Sarah, just caught up on your posts. Your yarn is beautiful! I can’t comment in detail as I don’t know much about the techniques, but the colors you’ve put together are very pretty. I hope you are doing OK by yourself. I know just what you mean. I really thought I’d be alone and happily so, but when I met Chris in college, that changed everything. I still crave my alone time, but if he’s gone more than a day, it gets a little too quiet around here, LOL. I hope your garden is coming along well in the spring weather. Must get out and weed mine soon! ahhhh! that red yarn is gorgeous!